Looking for a beautifully bronzed glow to take you into Spring? Look no further! 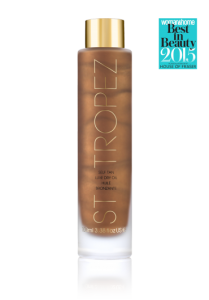 We’re so excited to announce that catwalk-favourite, St Tropez Luxe Dry Oil, is now available as a spray-tan treatment here at the salon; helping you achieve a gorgeous, natural spring glow in no time. St Tropez’s most luxurious tan yet, the new dry-oil formula offers an ultra-hydrating, quick-drying tan that lasts for up to 10 days; naturally fragranced with essential oils to avoid any chance of that tell-tale spray tan scent. We’re a huge fan already as not only does this pampering formula give you a subtle yet flattering glow, it also benefits from fantastic fade technology- fading gradually to ensure you’re not left with any fake-tan patches (vital for maintaining that ‘natural’ look). Priced from £30.00, you can book your glow with Laura or Hazel now. Simply give us a call on 01242 530598 or book online here.